akupofkatie: #31days October Writing Challenge >>> Day 13! #31days October Writing Challenge >>> Day 13! If the wittle bebe stays sleeping, than you can keep reading! This weekend was another happy one! I can't tell you how often this girl makes us smile and laugh! She is such a trooper! She went to church, an arts festival, a bar, and running. She likes to hang with the big kids. We ended our Sunday with a sunset run. Have I mentioned how much I LOVE working out with my man? Who else is watching Amazing Race? No really, it's OUR show. I need to devote an entire blog post to Amazing Race! 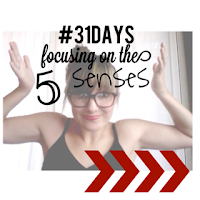 Click below to read the rest of the #31days posts! Happy Birthday to Ruthie Hart! We met as bloggers and are now dear friends. Much love to you today Ruthie Mama!! Go visit her blog and give her some lovin' today!